With the Republican National Convention set to open in just over a week in Cleveland, Ohio, there are widespread doubts within the GOP that the party will unite behind the presumptive nominee, Donald Trump. A new Pew Research Center survey finds that 54% of Republican and Republican-leaning registered voters think disagreements within the party will keep many Republicans from supporting Trump. Fewer (38%) think the party will solidly unite behind him. It is unusual for partisans to doubt that their party will unite behind the nominee at this stage of the campaign. In 2012, a majority of Republicans (65%) thought their party would unite behind Mitt Romney in the spring of that year and about the same share (63%) believed that the party would unite behind John McCain in 2008. On the Democratic side, sentiment is much more positive: 72% of Democratic and Democratic-leaning registered voters expect their party to unite solidly behind Hillary Clinton, compared with just 24% who think disagreements will keep many from supporting her. The share of Democrats who think the party will unite behind Clinton is up 8 percentage points from March; there has been no increase in the share of Republicans who expect their party to unite behind Trump over this period of time. At this point in the campaign, there are signs that the lack of unity on the Republican side is affecting voter preferences. In a general election matchup, Trump receives the support of 85% of Republicans and Republican leaners, compared with the 91% of Democrats and Democratic leaners who back Clinton – a modest but significant difference in support within the candidates’ respective parties. Doubts that the Republican Party will unite behind Trump are particularly widespread among Republicans who preferred a candidate other than Trump in the GOP primary. 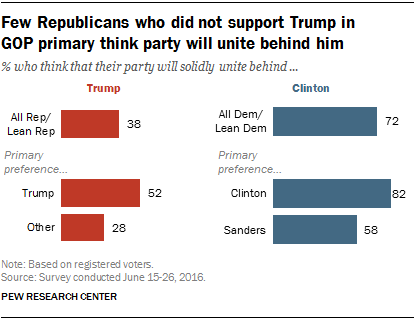 Only 28% of Republicans who did not support Trump in the primary think the party will solidly unite behind him. Even Trump primary supporters are not certain the party will come together: 52% think the GOP will solidly unite behind Trump, but 40% do not think this will happen and 7% aren’t sure. Among Democrats, 82% of those who preferred Clinton in the primaries expect the Democratic Party to solidly unite behind her. Those who supported Bernie Sanders are significantly less likely to hold this view. Nonetheless, a 58% majority of those who preferred Sanders expect the Democratic Party to come together in support of Clinton. One factor tied to feelings about GOP unity is the belief among some Republicans that Trump does not represent the views of average party members. Overall, 62% of Republicans say average Republicans in the country generally agree with Trump on most issues. However, three-in-ten say that average Republicans do not agree with Trump’s positions on issues. Among Republicans who say rank-and-file party members do not agree with Trump on most issues, just 19% think the GOP will solidly unite behind his candidacy. A far greater share of those who say average Republicans generally agree with Trump expect the party to come together in support of him (49%). By a 81%-14% margin, most Democrats say average party members generally agree with Clinton on issues, including 74% of those who preferred Sanders in the primary. At this point in the campaign, Clinton receives slightly greater support from Democrats and Democratic leaners (91%) than Trump receives from Republicans and Republican leaners (85%) in a general election matchup. In part, this reflects the fact that Clinton does somewhat better among Democrats who did not support her in the primary than Trump does among Republicans who did not support him in the primary. Among Republicans, 77% of those who preferred another candidate in the GOP primary say they would vote for Trump over Clinton. A somewhat larger percentage of Democrats who preferred Sanders in the Democratic primary (85%) say they would vote for Clinton over Trump.